Many people have commented on my neglected blog lately. I have no excuse. As the weather turns colder I will get motivated to make some posts. 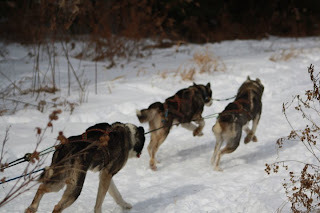 I have moved two of my dogs to Owen Sound so that they can run this year. They are enjoying there time up North with Mark. I am enjoying their training sessions on Facebook. 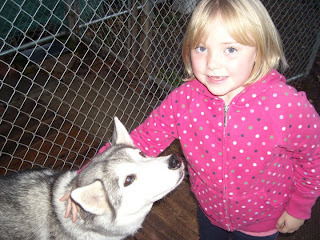 My Sasha who turned 10 this year has a new kennel mate and they are such good friends. Lily has come to us from Bob and Kathy and we love her. I was luck enough to race Lily acouple of seasons at Kortright so I was happy to get her.She is so funny and makes us laugh everyday. They are not training to race this year as they are retired and they are learning to walk without dragging are arms out (work in progress-may never ever happen). 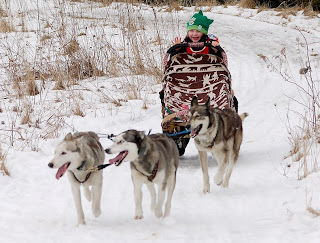 I hope to get the two of them to take Natalie to and from school this year by sled when the snow finally arrives. This will please them both and Natalie of course.We tried it last year with the pups but they just wanted to run on the road and there just too many cars in Burlington to pull this off. Sasha and Lily have been walking to the school so they should know the route(return it should be two miles so a little fun for them). 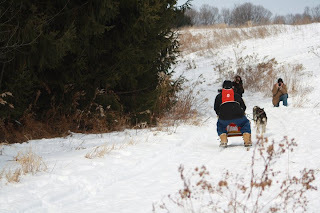 The Kortright race is planned for February 4/5 2012. It is the same weekend as Marmora but most of the Siberian Sprint racers don't usually go to Marmora anyways. I am disappointed I had to have it on the same date but the it was sceduled as the same date as Cannington this year. Many of the siberian racers go to Cannington so them the breaks! I will give more Kortright information into December and January. WOW, time flies when your having fun!!! My Sasha turned ten today. Great times we've had. 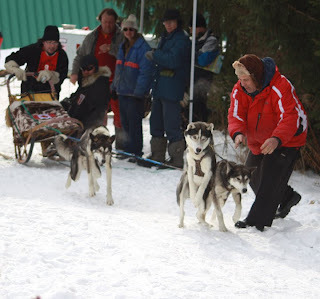 Racing Haliburton, Wasaga Beach, Shadow Lake and of course The Kortright Centre. She has run with many different dogs over the years. Even running on her own when she got loose and ended up in Bolton. Training and Racing with Kelly one winter. The old days running lead with Tyler at Heart Lake Rd. in Brampton on the Trans Canada Trail. 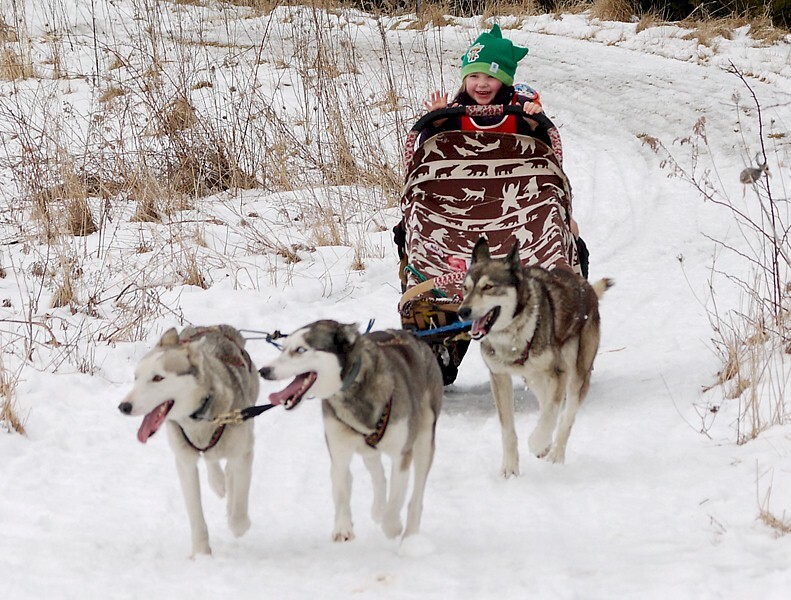 This year running with Renata's Ronan in Waterdown and at the Kortright Centre. Oh yeah running loose again with Geronimo on the first loop at Kortright. I managed to catch Cochise but the other two took off and ran around the first loop. Good thing there was a very clear trail and they ran right back at me. Between Matthew, Natalie and I we were able to grab them and put then back into the van. Matthew and Natalie in tears were sure they were gone but I was postitive they would come back to us (my inner voice was saying "there gone"). Happy Birthday Sasha ya old girl. SHCC Newsletter for March 2011 -incorrect!! The SHCC's Newsletter posted the times for the SHCC Southern/Central Ontario 3-4 dog Championships in-correctly. The Correct times have been submitted to sleddogcentral.com and two posts below this post. These times on my blog are correct as per the timer Daryl Schuler. 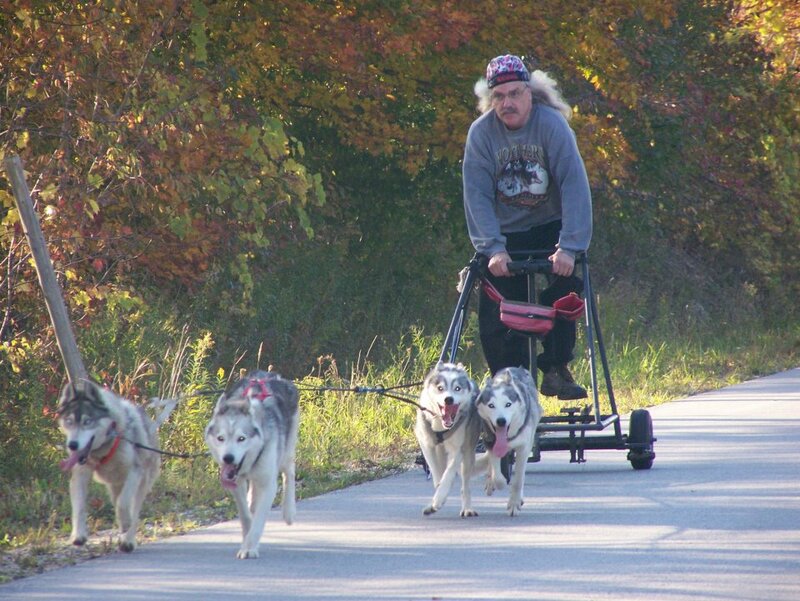 If you have any questions regarding the times posted on the Newsletter please contact me at dogsleddn@hotmail.com. 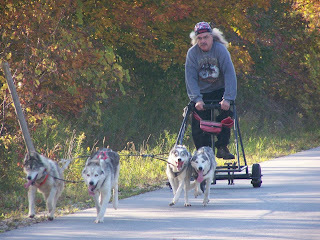 Looks like a tough race just got tougher for my friend Lance Mackey as he only has 10dogs left with half the race left. Martin Buser has the lead and is looking strong and he is hard to beat with the lead and the course record. I hope to get to the ckc dog show this weekend at the International Centre. Yukon Quest finishes and Iditarod ready to start 2011. 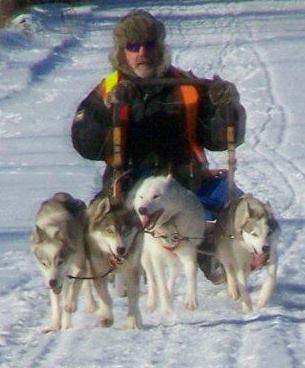 Congrads to Mike Ellis as the top siberian team at the Yukon Quest. Congrads to Hank DeBruin from Winterdance,Haliburton,Ontario for finishing in Thirteen place and winning the red lantern. I guess I should mention this years Champion and rookie racer Dallas Seavey. Wow!!!! 25 teams enter and 13 teams finish what a tough trail. 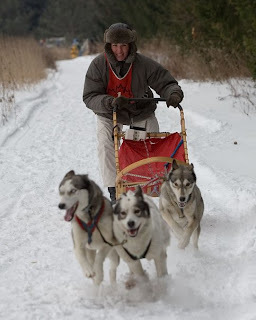 The Iditarod to start March 5th. A big race for our friend Lance as he has a chance for 5 wins in a row. Everyone will be gunning for him but it's hard to vote against him with his great conditioned dog team and four back to back to back to back wins. 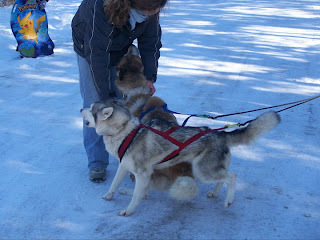 I wish everyone a save race and I look forward to following it on www.iditarod.com. They say there is a Race in Cannington this weekend but I find it hard to believe. Well, great weather and a great race at The Kortright Centre. The trail managed to hang in there and everyone had a ball. There was over 1300 spectators that enjoyed the race over the two days. 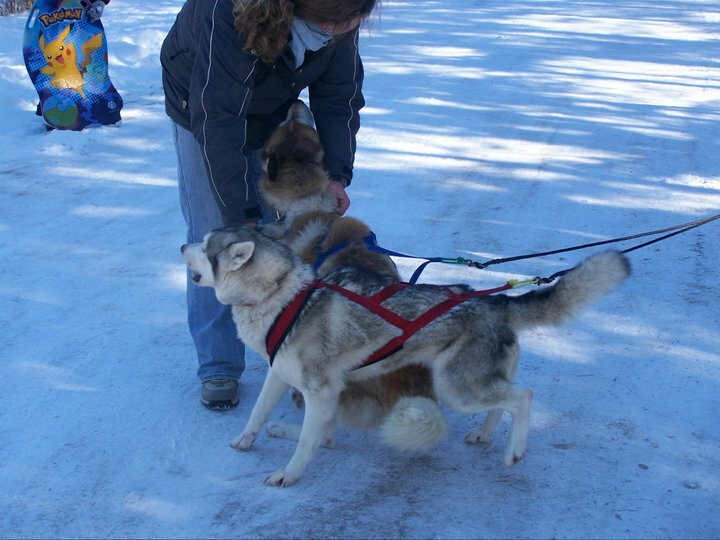 Rides provided by windrift kennels all weekend(more on them on my link). The Kortright Centre provided an excellent lunch both days for mushers and handlers in the Deer room. A nice time to talk with each other and spend some time with old friends. Nutro Products provided another excellent startline that was loud and clear on the Sunday night news on CTV if you had a chance to see it. They profiled many of our racers and a real nice interview with Walter Grohman explaining actually how much siberian racers love their dogs...it's true Mary!! Everyone has emailed me,called me and facebooked me with great reviews. I spoke with Lynn via email Saturday evening and I was happy to report that Barry had just bruised his ribs and will have to take it easy for a little while. I was so disappointed that I was so ill for my event but I had to go home as soon as I could. Thanks to Peter F. for Marshalling-a great job once again. Daryl S. for timing. Terry Baird and everyone else helped racers get to the line. It was also great to see Jim Cunningham at the race who has been to many races across the country and emailed me what a great race I have here!!! Thanks to Linda and her crew for totally taking over and handing out prizes Sunday. **Colleen I will get your prize money two you!!! Your t-shirt,SHCC crest, Kortright Pin, Kortright keeper trophy/maple syrup and second prize photo of signed Jamaican dogsled team photo. Hope to see you all next year or at the next race this year!!! There is a drivers enterance 1 kilometer north of the main gates on the same side. Drivers can enter this driveway and driver straight to the startline. Spectators use the main gate at 10am.